Looking at my calendar right now and seeing that it says “July 31” I can’t help but feel a little sad that in a few more hours this month will pass. I have such an admiration for July. While I usually use June to go on trips, I spend the month of July taking it easy and truly enjoying summer life. When August comes around tomorrow it is our unofficial start of the fall sports season for us staffers in Grizzly Athletics and although I really do have a couple more weeks of summer fun left, the laid back-care free attitude of July is no longer. This particular July for me was extremely nice. I didn’t do anything too special. I didn’t do anything crazy. I didn’t go to any big concerts. I didn’t go to Vegas or to Los Angeles as I have done the past couple of Julys. Except for a whirlwind day trip to a southwestern state, I didn’t even leave the ground. But this was all okay with me because I still managed to have a very enjoyable month. Let me explain a few reasons why. My Fourth of July was one of the highlights of this great month. The weather we had this month was out of this world. They say that Montana has two summer months, July and August. Even though they say that, July in Missoula still sometimes brings sketchy weather. Not this year. For pretty much all 31 days of July we got the weather pattern I absolutely love….hot and dry. We probably had at least 15 days where the temperature reached at least 90 degrees. For the other half of the days we were always comfortably in the 80’s. I was so appreciative of the sunny skies I saw each day along with the hot temperatures. This is what summer is all about and Mother Nature delivered. While not the trailblazer that I usually am during the summer months I did get to spend a little bit of time outside of Missoula, something that is much needed considering the time that I am confined to the city during the sports season. I pretty much made a tour of the eastern half of Washington State. I traveled to Spokane a couple times, Walla Walla once, and Dayton once. All of the driving I did was on clear roads with beautiful scenery. 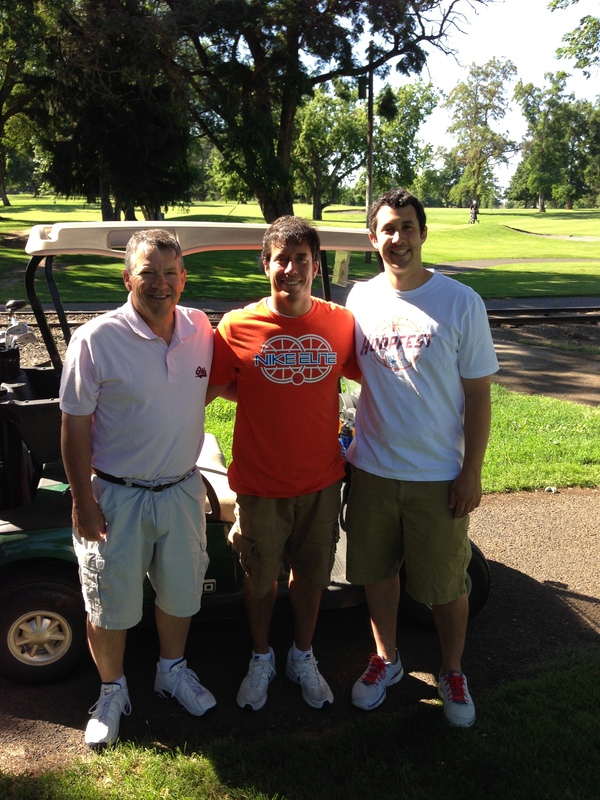 Golf was one activity that made this month great…playing with my dad and bro made it even better. I also got to do plenty of summer activities during July! I got to swim, soak in the sun, go to a beach, BBQ, golf, eat ice cream, watch baseball, hang out at the pool, play lawn games, and enjoy a few cold ones. I definitely felt like a lazy summer all-star over the past four plus weeks. I became one with the outdoors and loved every minute. But what made the great weather, the road trip travel, and the fun activities of July so memorable for me? It was that I got to spend it with the people I love most. I got to see my family twice during July and both times I had an absolute blast. 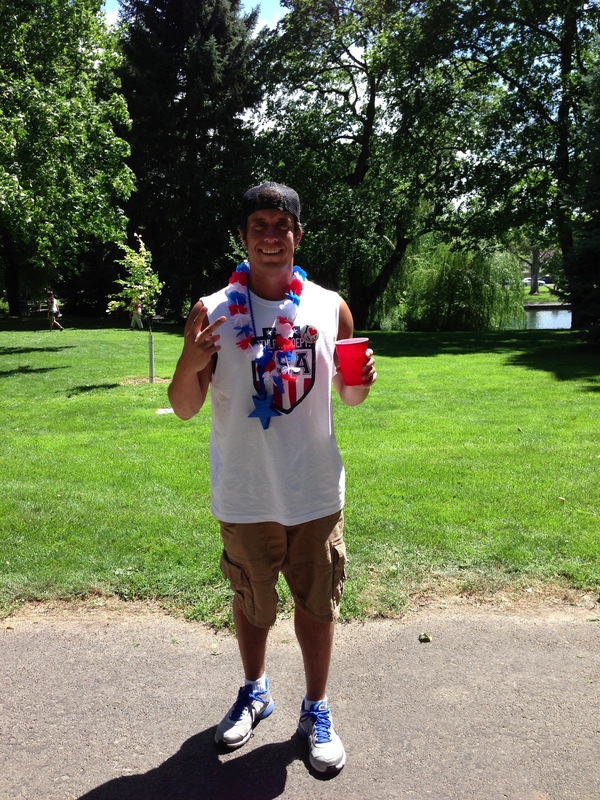 I had the most fun over the extended Fourth of July weekend as I have had on that holiday in a very long time. July 5 will go down as probably the best day I had all summer and getting to spend the majority of it with my brother and dad was special. This month I had such an amazing time hanging with my family as we traveled, laughed, watched movies, BBQ’d, drank, and just enjoyed each other’s company. I am ready for August but dang it, I am going to miss this month. Nothing beats summer. Don’t Blink. The hitting coach of the Miami Marlins, Tino Martinez, recently resigned from his position amid allegations that he “verbally abused” his players. What I am about to write has nothing to do with the fact that I consider Tino one of my all-time favorite baseball people. I freely admit, he was a boyhood hero of mine when he played for the Seattle Mariners in the mid 1990’s. I also admired his studio work for ESPN. But those things in no way contribute to why I am writing this. Rather, Tino Martinez’s experience in Miami just kind of provided the last such story I needed to hear before voicing my opinion. I find it astonishing that grown athletes, especially athletes getting paid millions of dollars at the professional level, can’t take tough coaching. I have read reports from both sides and basically what it boils down to is that Tino got in the faces of players, dropped the F bomb, and ran a very tight ship. What’s the big deal? I find it reprehensible the type of coaching style that someone like ex-Rutgers basketball coach Mike Rice used. He physically harmed players on multiple occasions and called them names that no one should ever address another person by. Reports also surfaced about the ugly, personal names Julie Hermann addressed her female athletes by while a coach at the University of Tennessee. These two examples display everything that is wrong with coaching. I benefited from tough coaching. Who knows, maybe I am totally off base. Maybe coaches who vocally challenge athletes need to cool off and help to preserve young people’s self-esteem. Or maybe I am just old school. I grew up playing sports. By the time I reached the fifth grade, I became totally accustomed to getting yelled at. I quickly learned that If I did not perform well or if I did not make improvements, I could expect a loud reprimand. When I entered high school the tough coaching just intensified that much more and I just rolled with it. At the time, my teammates and I got half of it. We understood that aggressive coaching made us more disciplined and it helped us to really notice our mistakes and prevent against them in the future. Several years after I stopped playing sports I got the other half of it. Getting singled out and screamed at on the practice/playing field gave me much tougher skin and made me much more receptive to constructive criticism and even not so constructive criticism. I see some people without a sports background get flustered and bothered if they are challenged or taken to task. They take it personally and fall apart. Because I had superiors (coaches) yell in my face, cuss at me, and yes, even grab me at times, I stay cool under pressure and better yet, respond effectively to it. If I made a list of the top ten times that I got chewed out in my life, most would come from when I played sports (if only I had video of each of those to show you). Each of those instances helped to build my character today. It is a shame that a story such as the one with the Miami Marlins came out. Presently there are a lot of people out there who want to end the loud voices and the passionate lectures at the youth and high school level (they probably also want to get rid of tackle football). If the message is sent that this type of coaching is not acceptable at the highest possible level where grown men are paid high salaries than surely they are going to reason that it has absolutely no place around 13-17 year old amateurs. This scares me. The type of coaching that Tino Martinez lost his job over taught me accountability, competitiveness, and resilience. It also made me a stronger person. Just as we still need tough love, we too need tough coaching. Don’t Blink. No, I am not talking about Ohio. In fact, Dayton is located in the southeastern part of Washington State and boasts a population of a little over 3,000 people. The town had their high school team win a state championship in basketball several years back and that achievement is pretty much what they use to market their town to tourists today. As I mentioned, I am storming into Dayton to celebrate my uncle’s birthday. I only make spur of the moment trips to out of the way small towns on special occasions and because my uncle is celebrating a milestone 75th birthday it qualified. My Uncle Jim is my dad’s oldest brother, actually my dad’s oldest sibling out of the eight original Reser Kids. Many of my aunts and uncles will be at the celebration today and when you combine their families you got yourself a rather large gathering. Word on the street is that today’s birthday celebration is taking a brunch form with plenty of liquid refreshments to go with it. Hello Dayton and happy birthday Uncle Jim. It should be fun! Don’t Blink. I felt a lot of sympathy when news broke last Friday that a woman died while riding a roller coaster at Six Flags in Texas. While riding the most popular attraction at the park, The Texas Giant, the woman was ejected from her seat and fell 75 feet to her death. Not a pleasant way to die. Before taking off on the ride, fellow passengers told investigators that they heard the woman tell one of the roller coaster workers that she did not feel secure. Yikes. I am not a big roller coaster fan. In fact, unless someone is challenging my manhood or a cute girl is begging me to ride with her, I will pass. The biggest reason for this is not because of the high speeds. It is not because of the possibility of throwing up when I go upside down. It is not because of the violent dropping of the stomach I get when cruising down the big declines. Rather, the reason why I usually avoid roller coasters is because of how I feel riding them, the exact same way the Six Flags victim felt right before her disastrous ride took off…unsafe. I feel pretty uneasy when I get on a roller coaster or some other mega thrill seeking ride. I have had times when I felt like I was going to get blown off, fall off, or have something hit me. Instead of enjoying the ride for its twists and turns and adrenaline rush, I have had times where I wondered if I would get off alive. I feel this way even though I know the facts. After the Texas incident it became a well-distributed statistic that the chances of getting seriously hurt on a roller coaster is 1 in 24 million. But for whatever reason, when I get on a coaster I feel as if 23,999,999 riders have successfully made the voyage and I am passenger #24,000,000. I think I just lack the nerves of steel to ride some of these attractions because I know many people who actually enjoy feeling unsafe and completely powerless. I don’t think I am completely irrational when it comes to roller coasters, though. I have recently rode New York, New York in Las Vegas, one of the most recognizable and biggest roller coasters in the nation. I have dominated Disneyland/Dinseyworld coasters. I will also ride from time to time roller coasters that I am firmly seated in as opposed to bars coming down and locking my body in. I stay away from the roller coasters at the smaller amusement parks, especially the older attractions. I also don’t go near carnival thrill rides. I have seen way too many questionable practices and one too many 20/20 reports to know that you have to have a death wish to ride some of those junkers. I actually think a lot of my distrust for the more secure and legitimate larger coasters came from the creaky, clunky rides at the fair. As sad as I am to say it, what happened last week in Texas kind of puts a little bit of rationality to my roller coaster concerns. Let it be known, I will not be making a spur of the moment late summer trip to Silverwood this year. Don’t Blink. I will go out on a limb and say that emoticons play a large role in our contemporary text messaging language. Not something reserved strictly to teenage girls anymore, you can find pretty much anyone with a smart phone inserting emoticons into their texting conversations. My guess is that most of you have seen emoticons before, but not all of you might know the term. At the start, emoticons were just facial expressions made by using colons, semi-colons, parentheses, etc . These days they are full blown mini pieces of clip art that people use to add expression and meaning to their text messages. To access a database that contains hundreds of these pictures, most people simply download an app that sets them up. Emoticons are used all the time in text messages. Remember five years ago when grammar buffs and educators were appalled and scared out of their minds about the prospect of the short hand ways of texting and instant messaging ending up in the academic arena? Well, because of the widespread use and acceptance of emoticons I think seventh grade teachers have even more to worry about than just seeing “IMO” or “BTW” on a report. I think they should start bracing themselves to see images of cats with hearts for eyes, Pac-Man fruit, and praying hands on the next term paper. I really don’t think it is that far off. But besides the extreme examples of emoticons corrupting the educational system, what can they really offer the millions of people using them for their intended purpose (communicating via text)? In my opinion, I like them. I think people can actually be really clever with them and make conversations fun. I think they do help add meaning and context to text messages, kind of a visual hash tag if you will. I further think that emoticons show engagement and interest by the texter. When someone takes the time to send a text message that took them six seconds to send because they selected an emoticon as opposed to three seconds to send if they opted not to use one, it shows that there is a level of care and thought. Yes, I do think there is the tendency for some people to go a little crazy with emoticons. Sometimes it is cool to see people tell stories with a string of 24 different pictures but if that is primarily how they communicate then chances are I don’t text them on a regular basis. I also think care needs to be taken on what emoticons you send someone, as sometimes people interpret them differently. For example, I was texting my friend the other day and she responded with the thumbs up emoticon. To me the thumbs up image came across as sarcastic. Even though I knew I was reading too deep into it and she even assured me that there was no sarcasm intended at all, it became clear to me that emoticons can send mixed signals. Personally, I am a moderate emoticon user. I throw in an emoticon every now and then to my friends but I don’t by any means rely on them. I am a fan of using the weirdest, funniest looking ones to randomly insert into conversations. Emoticons will continue to hold prominent spots in texting conversations. The available database will no doubt just get bigger and bigger as time rolls on and companies keep introducing new sets. The opportunities to spice up conversations will continue to grow, something that I think is a great thing. I embrace emoticons for use in the casual text message but I am with all the academics out there…don’t ever think about inserting one into something that you are going to turn in. Don’t Blink. I usually get one of two responses when I tell someone that I served as a resident assistant during my college years: 1. Wow, really? That’s kind of crazy. Or…. 2. No offense, but that doesn’t surprise me at all. Of course the second response is made in a way that implies that I am a nerd with no life, which of course is only half true. But more on the makeup of a resident assistant in a little bit. 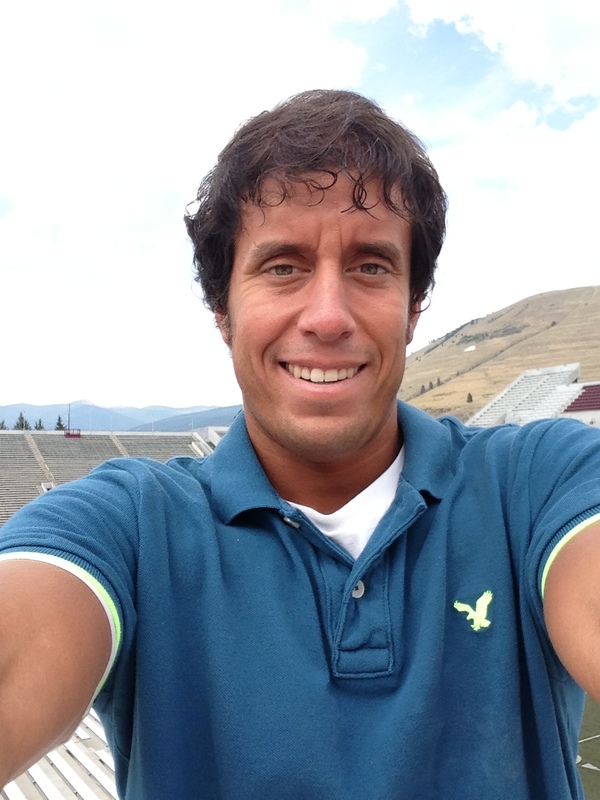 First, some bio information: Over the course of three academic years from 2006-2009 I was employed by the University of Montana as a resident assistant (RA). For those who don’t know, a RA is someone who manages a floor in a dorm on a college campus. Such a person keeps order on the floor, deals out discipline, stages events for the residents on the floor to take part in, and works with the other resident assistants in the building to make sure that the residence hall is ran in an efficient, safe, and healthy manner. 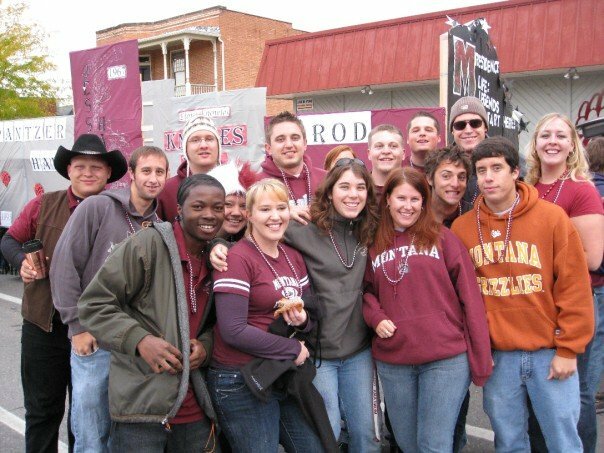 This is me at a Griz football game with residents from my first ever floor during the 2006-07 school year. Everyone who serves as a resident assistant will have a vastly different experience. I know for a fact that my experience at UM probably differed tremendously from other resident assistants working around the nation at my time. I worked during the twilight years of a residence life advisor who had overseen the program for decades. Because of this, things were ran a little old school. Residence halls were still called dorms, the end of training was celebrated with a party that included a couple kegs, and most discipline problems (including alcohol) were dealt solely by the resident assistants. Although much of this has now changed I can say that from the eyes of a former RA that the residence life program at Montana ran very smoothly. My first year I worked in a dorm which was, how shall I put it, showing its age. I presided over a floor of around 50 freshmen boys so in addition to its age it was also a dump. I spent a lot of time doing alcohol and drug write-ups. My second and third years I had the luxury of working in an apartment style living building with mainly upperclassmen. The floors were co-ed and the people were clean. I had very few discipline issues. Despite the obvious differences between the two different residence halls I worked in, I had a great time in both. Me hanging out with some of my exchange students. At Montana, and at many other schools, resident assistants are compensated well. I received free room and board, a huge burden lifted from someone who was trying to do everything possible to save money. Montana’s system also allowed for money to be earned for the hours worked at the front desk after a certain amount of contract hours were met. Many people consider drawbacks of the position to be a lack of freedom, a sacrifice of certain holidays, and a glorified babysitting role. So is the compensation actually worth it? I mean who wants to miss out on Friday night college shenanigans? Who wants to call the custodian to clean up vomit? Who wants to miss spring break? Who wants to write incident reports at 3 a.m.? The answer to my first question is NO. Although it did help me a lot, the room and board compensation alone is not worth it. What makes the job worth it is purely the relationships that are built and fostered during anyone’s tenure as a resident assistant. A big part of the new relationships come directly from the people you work with on a daily basis, your staff. Although you work closest with the resident assistants in your particular building, you also become part of the whole community of resident assistants on campus. Through orientation and events throughout the year, friendships and connections are made. As I alluded to at the start of this post, 95% of resident assistants are nerds (including myself) but that same percentage are also very driven and intelligent people. You meet many stellar individuals with bright futures. 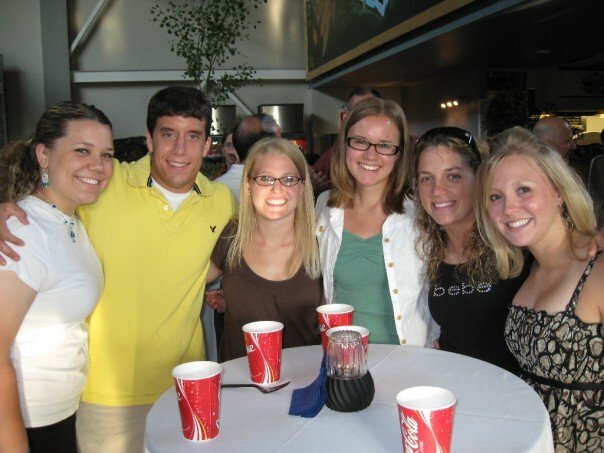 Here I am pictured with some fellow resident assistants who I got to know pretty well. Because there are so many cool members on staff many resident assistants will fall into a trap of hanging out mostly with other resident assistants but I was tipped off from the beginning not to do that and I made sure to follow through. By and far, the best relationships you can make in a resident assistant position are with your residents. With fifty students each with a different story and background living on your floor in a given year, the opportunities to expand your horizons are limitless. I did all I could to connect with each resident and develop some type of a relationship with each one. Sure there were a few who I never want to cross paths with again just because they were bad people but for the most part I found common ground with everyone. Playing intramurals, hanging out in the hallway, and participating in my weekly corny floor activities served as the basis for developing relationships that have lived on past the time in the dorms. 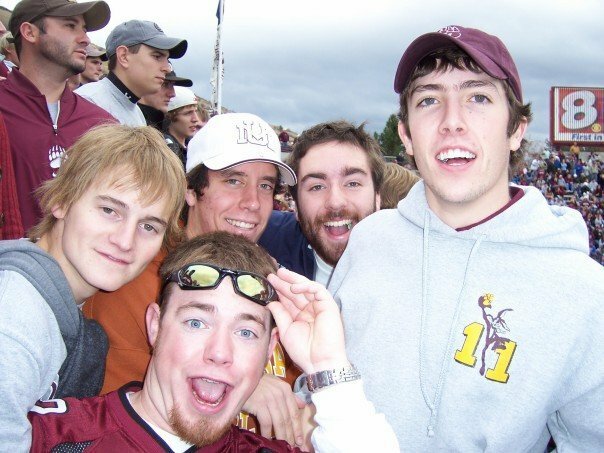 To this day some of my closest friends are from the floors I was a resident assistant on. If you hate free room and board and despise relationships, become a RA just to observe student culture at its finest. You get to see students prosper and you get to see students completely implode. You get to experience different traditions, try new foods, and get different point of views. You get to monitor the homegrown Montanan, the kid from back east, and the exchange student from Italy all at the same time. You get to watch fifty people who don’t know each other converge on the same floor for a whole school year and see how the different attitudes and backgrounds play out. It is pretty interesting. 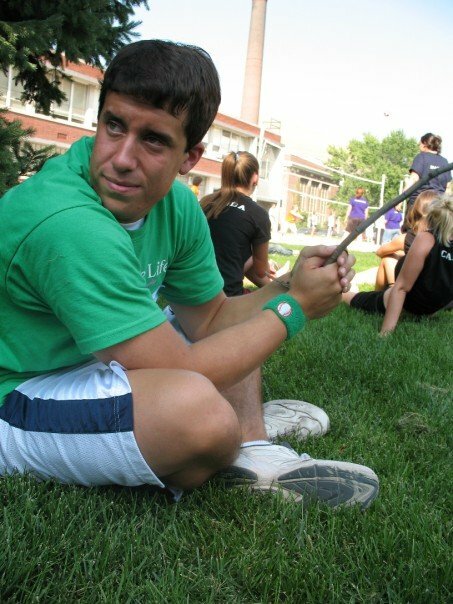 During RA training I grabbed hold of a stick. I would recommend becoming a resident assistant to most people, even the ones who worry about missing out on a lot of college’s fun experiences. To be honest, another thing that I got from my time as a RA was structure. The nights I stayed in and the day festivals I missed helped me be a better student and a better mentor to my residents. 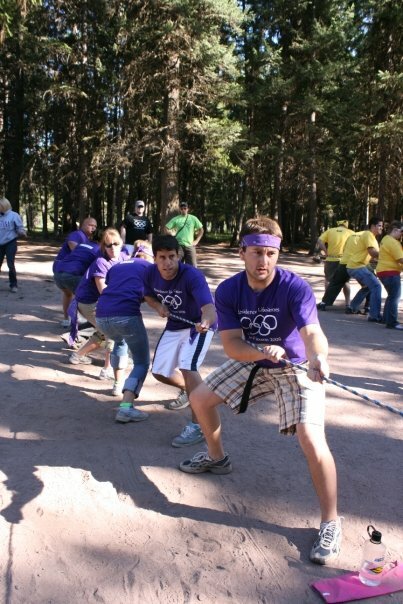 Apply to become a resident assistant and reap as much from your experience as you put in. Don’t Blink. 1. The Overachiever: The overachievers are the students who were 3-sport athletes in high school, valedictorian, held leadership positions, and had an awesome freshman year of college. 2.The Turtle (Coming out of his/her shell): These people become resident assistants because they want to meet more people and take on a challenge that they normally would not. Many of these people will attribute their desire for pursuing the position because they had an exceptional resident assistant of their own. 3.The People Person: These people don’t necessarily have a standout past, rather they just love life and love people. They are accepting of everyone, hold many quirks of their own, and just want an outlet to let their personality shine. 4. The Mistakes: These are the people who are awkward, don’t make an effort to reach out to people, and who most likely play video games all day long. As with any position, sometimes unqualified people are hired. In my main post I didn’t mention the hall secretaries and custodians. This just goes back to the relationship piece I talked about. I developed great friendships with the two hall secretaries that I worked with, friendships that still exist to this day. Also, I became very well acquainted with the hall custodians…talk about the most thankless job on the planet. When you sign a resident assistant contract you agree to stage a certain amount of hall activities during each semester. I went a little overboard and staged them on a weekly basis, sometimes even twice a week. Some of my floor activities included: Name That Tune, Rock-Paper-Scissors tournament, culture night with exchange students, karaoke night, 2012 End of the World Debate, bouncy castle extravaganza, Mafia Night, SPOONS, didgeridoo demonstration, Mario Kart competition, and Missoula Restaurant trivia. In each residence hall at the University of Montana you have a head resident and an assistant head resident in charge of the resident assistants. Both of the positions just mentioned (the term “supervisors” is used as an all-encompassing term) are filled by students as well. For the head resident and assistant head resident the responsibilities and pay are both more than that of a resident assistant. I applied for a supervisory position going into the final year of my time as a resident assistant. I ended up not getting one of the positions and to this day I still consider it as one of my greater personal disappointments. Believe it or not, back in my day they put us through a month long training/orientation session. Starting at the beginning of August and running until the start of school we sat through lectures, demonstrations, and staff bonding exercises. Although I thought it was pretty excessive I never complained when they took us up to a super nice lake area for the ending portion of the training where they let us enjoy the Montana outdoors and eat like crazy. Whenever I pay my rent check I always thing about how nice it was to live for free/Whenever I buy groceries I always think about how nice it was to walk 20 yards and eat all I wanted for free/ I don’t miss “making rounds” around the building/ One of the hottest, most gorgeous girls I have ever met happened to be a resident assistant/ Participating in the Homecoming Parade was always fun/ I continue to have a lot of respect for the residence life director who was in the position during my time/ Don’t Blink. Fun at the Homecoming Parade! As social media keeps evolving there will be certain practices that I love and that I hate. As long as this blog stays up and running, I will continue to write about them. Tonight I will focus on the latter, so as always I want to apologize for the negativity. I will make up for it in my next few posts. In tonight’s edition of Don’t Blink I want to quickly highlight three somewhat trendy practices in social media that I am not so keen on. Each practice I am about to highlight comes from a different social service but each one I believe carries with it unoriginality and a degree of laziness. I love social media because of its ceiling for creativity so when I see an example of something on Instagram, Vine, or Facebook that I feel has very little uniqueness or thought from the user I get turned off. Throwback Thursday Pictures That Aren’t Really Throwbacks: I am still all about the Throwback Thursday idea. I love seeing people’s pictures from years ago when they were in diapers, blowing out the candles on a birthday cake, or dressing up for Halloween for the first time. 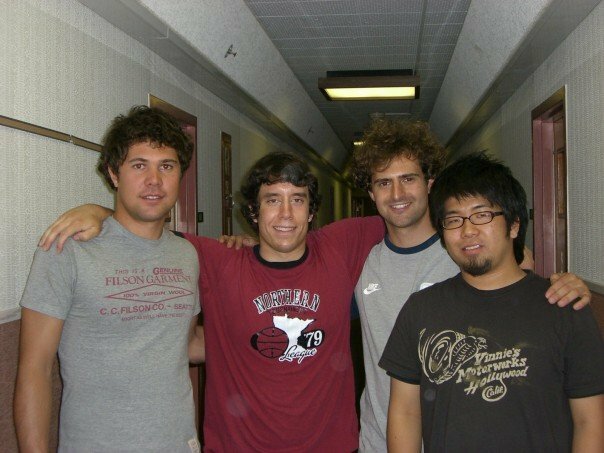 I also enjoy seeing people’s photos from maybe not all the way back in childhood but maybe from a time 10 years ago when they were at a different stage in their life and had a noticeable different style or appearance. I don’t enjoy seeing someone’s Throwback Thursday picture from their spring break Vegas vacation four months ago. I have seen plenty of Instagram users butcher the idea of Throwback Thursday and use photos that are just a year or two old and in many cases even more recent than that. If you post a TBT picture, it is a good rule of thumb to not post any pictures that you originally took on the iPhone that you are using at the present moment. To give a more straight-forward rule, make sure the picture is at least 4-5 years old before branding it a #TBT. If you don’t have a good Throwback Thursday picture I just advise not using one for that particular Thursday. Don’t force one just to say that you posted a Throwback Thursday photo. If you didn’t go through photo albums or search way back on Facebook to get your photo, chances are it does not qualify for TBT. I think sometimes people use Throwback Thursday as an excuse to just post a photo where they think they look especially good in or one that shows them doing something really cool that happened in the very recent past. This misses the point. The Revine: I want to give a lot of credit to Vine. With the introduction of Instagram Video, Vine has managed to stay relevant. It has kept its original fan base and continues to attract new users. The service has done all they can to maintain its status as a top app by introducing upgrades and new features. I applaud them for this but one of their new rollouts drives me crazy: The Revine. Going along with the same concept as a retweet on Twitter, Vine users can now take a video that they like and “revine” it for all of their followers to see. One day I was on Vine and it was completely normal as I viewed the content of the roughly 40 people I follow. The next day I looked at my feed and I was overwhelmed with weird people who I would never in my wildest dreams follow. Many of my followers had started to re-vine like complete randos and I no longer recognized my feed. I had no interest in the funny looking people doing bizarre things on my iPhone screen. It was actually a little scary. I liked Vine because I got to see my friends showcase their lives and experiences in cool six second videos. I liked the connection that I felt. The introduction of revining has smashed that connection and brought in a lot of garbage that I have absolutely no interest in. I propose that Vine just puts some limits on revining. I could live with it if the service limited users to one revine every 24 hours. While I would still get a little annoyed at stupid videos that I have no desire watching, it would prevent the people I follow from revining 10 random Vines in two minutes and totally taking over my feed. The Facebook Share, Share, Share Technique: Now I can see sharing a quote or funny joke once in a while on Facebook but I become a little dumbfounded by the people who use their profile simply to post memes, shared photos, cartoons, sayings, and whatever crap they can steal that already has 1,529,045 shares one after the other on their wall. I am including this in my post because I seem to see it more and more often. Don’t you get it? Your Facebook profile is there to market YOU. In that space you can let your personal brand come to life, you can showcase your individuality. Not only is seeing a junkyard of quotes and “first world problems” memes an eyesore, it shows that you have little to offer. I would honestly rather read long status rants and view low quality selfies on someone’s Facebook profile as opposed to recycled internet trash just because the former is an extension of the person, something of their creation. I am Facebook friends with you because I am interested, give me something to feed that interest. If you do use these practices on social media I don’t hate you. Chances are, I still follow you. I just think originality should always be strived for and social media is a great way to channel your creative juices. Show me what you got! Don’t Blink. I can’t seem to fight the marketing blood I got in my body as I have an idea that might change the world. Well let’s be honest, this idea won’t change the world at all but it would make the life of someone like me much more convenient. And if there is something that can make the life of Brent Reser a little less complicated than it has to be gold, right? Totally kidding. I have mentioned before in this blog that I have a little problem with my iPhone. For whatever reason, my phone can’t hold a charge. I will have my phone plugged in all night long and by the time the lunch hour hits I am down at 20%. By the time work ends I have recharged my phone back up to 100% only to see it at 32% by 9 p.m. I have tried everything from killing my apps when not using them, having the screen turn off in a timely manner after usage, and even not utilizing my phone as much but I have just learned to cope with that fact that my iPhone 5 is charge-challenged. Because of this I take my charger with me everywhere. When I say I take it everywhere I don’t mean that I keep it in my workout bag or in my car…I mean I keep it in my pocket with me at all times. I charge my phone at work, at restaurants, and at stores. If there is an outlet, I am using it. A low point came this Fourth of July when as my family gathered in a grassy area to watch fireworks I plugged my phone into the old, dirty outlet of the bathroom building on the premises to build a little bit of a charge. As I am conditioned to always have my charger with me in my pocket, I have never really thought about the horror of not getting an adequate charge while I happened to be out and about. However, I faced this conundrum just this past weekend. After a long day in the sun at the beach area of a river in Missoula, Paige and I went and ate dinner at of all places, Hooter’s. With being outside all day with no outlets available, my phone was down to under 10%. Luckily I had my charger and Paige had an outlet right under her seat. She plugged my phone in and then delivered the terrible news…my phone was not charging. The problem was my charger, not the outlet. Believe it or not, iPhone chargers sometimes stop working and there is nothing you can do about it. My phone died inside of Hooter’s and it just about ruined my whole meal. Now I know many places and events sponsor “charging areas”. At Spokane’s Hoopfest this year the local electric company offered a plentiful amount of outlets at a central area for people to plug their phones into. At a place where I sometimes play poker they actually have phone chargers around the playing area for people to plug into. However, I have an idea that has the potential to make a lot of money. If I had the money to startup a business, I would invest in a company that installed charging outlets in restaurants and other places where people gather. I would design an outlet piece that included built in chargers of the three or four most popular phones out at the time. I would then install these pieces at restaurants all across town. To activate these charging services, customers at the restaurants would pay a fee, let’s say $5, to plug their phone in for thirty minutes. Once the fee was paid the electricity would flow and the phone would get a charge. People who depend on their phone and can’t live without it (like me) would pay for this service in a split second. While many of us iPhone-addicts carry around our chargers and might initially scoff at paying a fee there are always those times where we forget to pack our charger, or, like in my case, our charger stops working all together. Also, if this service was offered many people would just stop bringing their charger with them in the first place knowing that they would have a legitimate and secure place to plug their phone into. To be honest, there is a level of shame that many of us feel when plugging our phones in at random places. We look desperate and we recognize that we are stealing the electricity of the particular place. To have an area where charging phones is promoted and encouraged would definitely bring some relief and comfort. After I installed the initial charger outlets across Missoula I guarantee some big corporate organization would take notice and pay me millions of dollars for the idea and the rights to take the concept to every restaurant across the nation. Life would be great. So there is my big idea for the month. Anyone think I am onto something? Anyone think it is just another one of my crazy ideas that will never work? Anyone think that I am a big loser? Please let me know, maybe we can go in on this idea together! Don’t Blink. I like to think I am strong-willed, determined, and fitness driven on most days. However, the days where I attend a marathon to watch participants cross the finish line I feel like the biggest sloth in the world. Yesterday morning, Paige and I drove to downtown Missoula and strolled over to the Higgins Street bridge where we watched as participants in the 2013 Missoula Marathon crossed the finish line, completing a task that many of us will never accomplish in our lives. For me, the first half of the battle is not even about getting physically in shape to do such an exercise, it is first wrapping my mind around the insanity of embarking on a race that is 26.5 miles long. 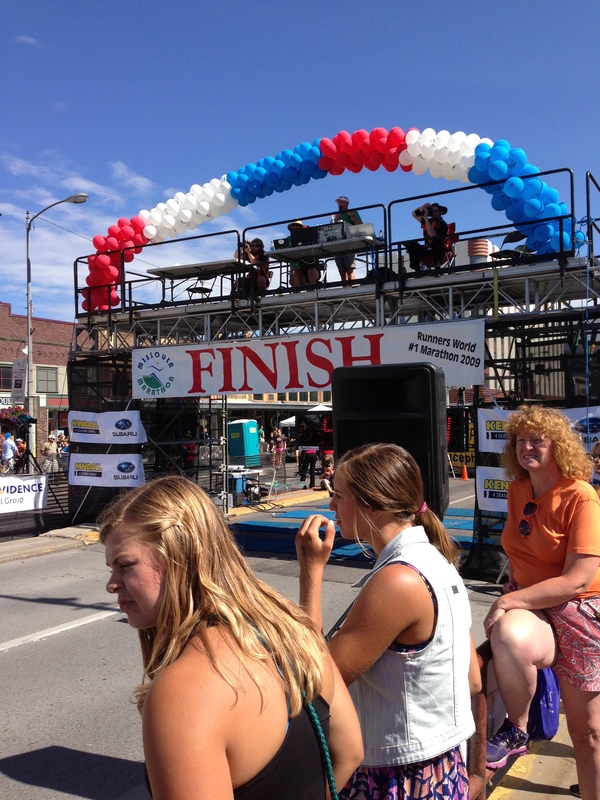 We camped out right at the finish line of the Missoula Marathon. I envy marathon runners because they are in such excellent physical and mental shape. If I had to pick a group of athletes to go into battle with me I would make sure that after I picked some of the toughest wrestlers around I would choose a couple marathon athletes. A couple times yesterday the P.A. announcer at the finish line would announce to individuals completing the race that “You are now a marathon finisher.” I heard him say those words and I thought about how cool it would be if I ever got to have that distinction next to my name. Under the beautiful sunny morning skies of Montana, Paige and I stood at the finish line and just soaked in one of Missoula’s premiere events. Runners from all over the country come to Missoula for the marathon (in 2009 it was named the best marathon in the nation) and in return the community really comes out to support them. I paid close attention to the reactions of people once they finished. Some, just like complete pros, finished through the line, stopped their watches, and casually walked through the staging area. Some cried. Some immediately looked for their friends and family who were waiting for them on the other side of the fence. Some grimaced in obvious anguish. All had the look of a champion. I had a couple connections for this marathon. Our Associate Athletic Director, Greg Sundberg, was participating in the half marathon portion of the event to raise funds for a local charity (Jadyn Fred Foundation). I made a small contribution to the cause and received a sweet orange Team Sundberg t-shirt that I proudly sported on Sunday. 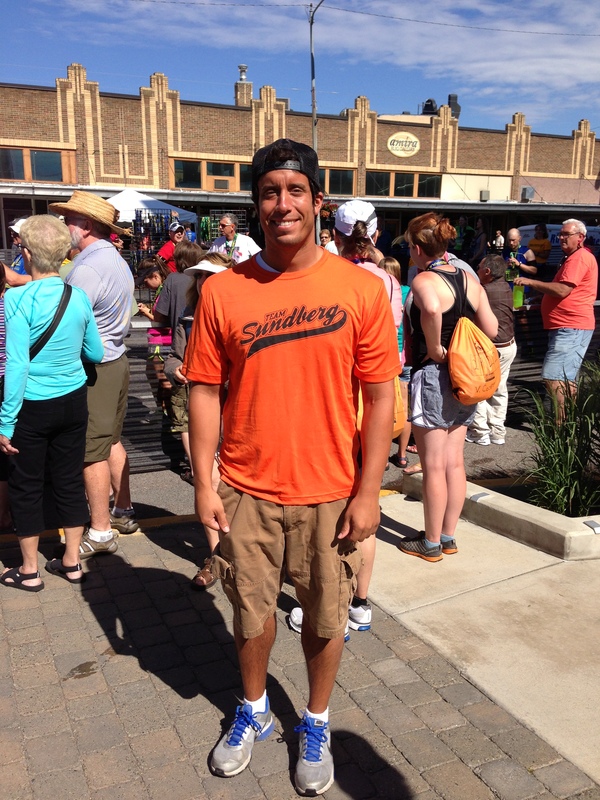 Proudly wearing my Team Sundberg shirt at the Missoula Marathon. Additionally, my friend Shaun Rainey was participating in his first ever marathon. He pretty much started training for the race from scratch and came out a complete winner on Sunday when he finished in a little under four and a half hours. I got to see him cross the finish line and then subsequently give a television interview about two seconds later. Congrats to both Greg and Shaun. 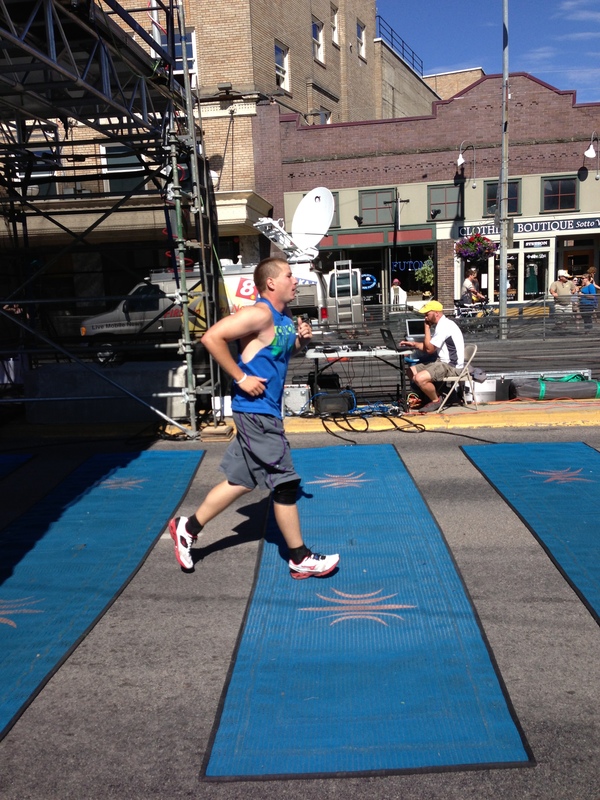 Shaun crossing the Missoula Marathon finish line at a little under four and a half hours. I needed that reality check on Sunday to tell me that no matter how well I think I might be doing in the gym there are people out there doing much harder and much more remarkable physical tasks than me. I need to challenge myself a little more and get better. Thanks Missoula for the inspiration! Don’t Blink. Although I don’t necessarily like watching them, I do understand why they are on television. Personalities like Rachel Maddow, Bill O’Reilly, Keith Olbermann, Sean Hannity, Stephen A. Smith, and Skip Bayless are all the same in two main ways: They are extreme and they are loud. All these people have set in stone views (at least on television they do) and most of them need to yell to voice them. These people bring in viewers because they are so polarizing…you either love them or you hate them. Even if you can’t stand them, these people are so good at what they do that many of the haters still watch them. You know why? Besides just offering a differing viewpoint that can sometimes be fun to watch, all of these personalities carry with them a certain level of charm. Many times it goes across to the viewer sublimely and you might call me crazy for saying that these talking heads possess charm but they do. Most of them are also able to show some civility and rationality in their programs, even if it comes in small amounts and on rare occasions. I used to think Nancy Grace fell in the above category. I watched her show a few times in the past and she seemed like the typical shock value blowhard. Then I managed to land on her show a couple nights ago and my whole opinion changed. While channel surfing I landed on HLN for a split second and without even considering watching whatever program was on, I flipped to the next station. In the very short time it took to transition from the HLN channel to the next one I heard a woman’s voice yelling at the top of her lungs. I immediately changed back to HLN and there was Nancy Grace, on a split screen, going absolutely nuts on the other person who happened to be on the other half of the screen. Because I read the graphic at the bottom of the TV I knew they were supposedly talking about the George Zimmerman case but you never would have figured that out from the one-sided conversation going on. Nancy Grace was flaying her arms, yelling at a level reserved for boot camp instructors, and throwing a huge fit on national television. Her “guest” on the show tried to cut in but then Grace did something I had never seen before…she asked the show producers to mute the mic of the guest. She then continued to berate the guest and after she was done with the tongue lashing she mocked the guest for having his mic muted. The segment then ended. I couldn’t believe it. Thinking she might have had history with the guest or that maybe the guest had gotten out of line during the first part of the interview, I stayed through the commercial break to see if Grace’s behavior would change during the next segment. It didn’t. This time she had a panel of four people joining the show from various locations to talk about the Zimmerman case again. Four different people with four different perspectives on the case…it would have been nice to hear what they had to say but each one of them could have put a sack of potatoes in their place because they had no opportunity to talk. Just like before it was Nancy Grace getting that evil look on her face and yelling the whole time, speaking over people and just flat out acting embarrassing. She would take shots at the credentials of her guests, make fun of them for stuttering (only reason why it appeared they were stuttering was because Grace cut them off), and belittle them. After that train wreck, I changed the channel. I will admit that Grace’s antics got me to watch two segments of the show and HLN might consider that a victory. Okay, fine. But from here on out I will never watch Nancy Grace again. The way she ran her show, treated her guests on a national stage, and displayed an amount of disrespect that I had never once seen on any show in my life sealed the deal. Like I said at the very start of this post, I understand the game many of these personalities play. I don’t take them seriously and I know that many of them don’t take themselves seriously either. But they do offer a product that people watch. However, Nancy Grace goes way too far and earns a spot in a whole new level. Nancy Grace, you got my viewership for ten minutes on a Wednesday night. You will never get it again. Don’t Blink.